I have decorated an A5 book for my project. I like to keep a note of the presents I give at Christmas each year so that people don't get the same thing!!! I covered the book with 2 layers of white gesso before adding some white modelling paste through the pretty STEAMPUNK CHRISTMAS TREE STENCIL. I also added a little texture paste through some punchinella here and there. 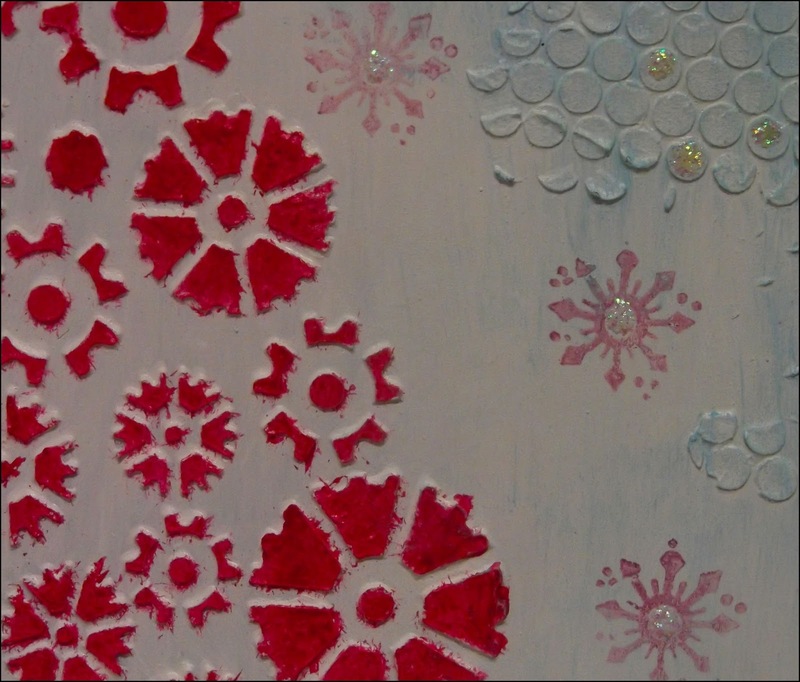 While this was drying I took 3 snowflakes out of the MINI SNOWFLAKES PACK and painted them in pale blue before covering them with stickles. 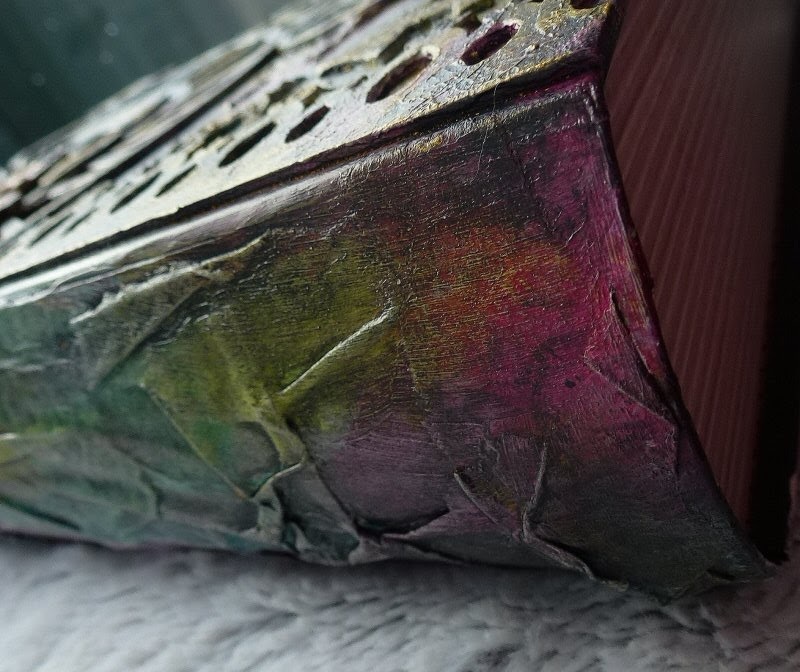 A small bookplate was painted with primary Magenta, covered with Crackle Glaze then had Titanium antiquing Cream rubbed into it when dry. When the book cover was dry and set I painted over the whole piece with Titanium White and added some little stamped snowflakes in Archival Plum, using the 2nd stamping. The stencil was replaced and Primary Magenta was stencilled onto the tree. Some pale blue was dry brushed in places. 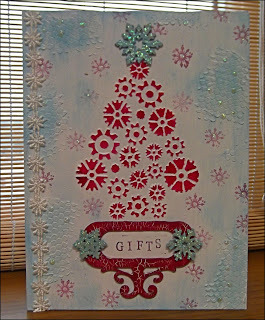 I stamped the word 'Gifts' onto some white card and glued it to the bookplate before glueing it to the base of the tree. 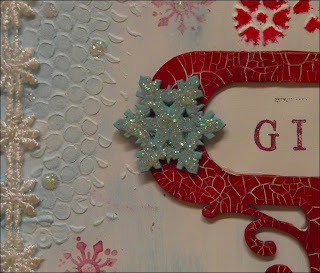 The snowflakes were glued in place and some more stickle dots were added here and there for extra sparkle. Some fancy lace finished the book off. 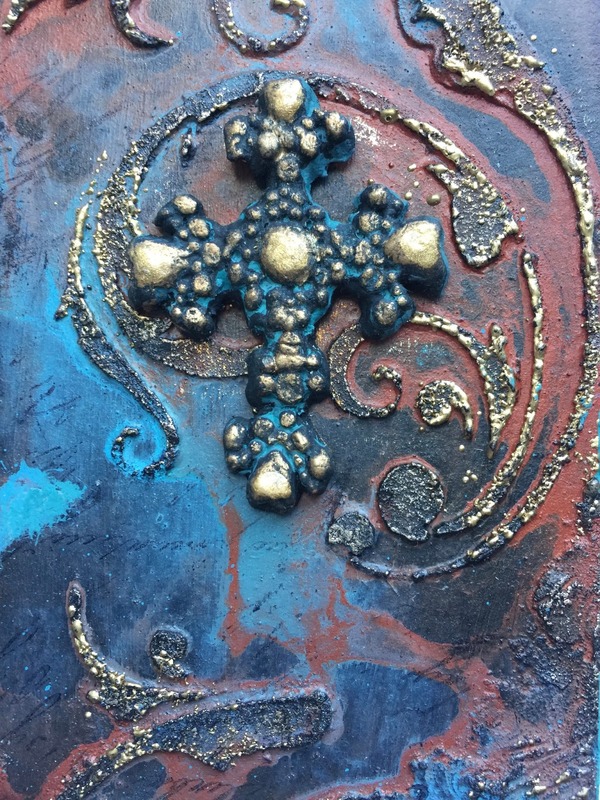 Hello my dear crafty friends and welcome to my Embossing week Tando inspiration. 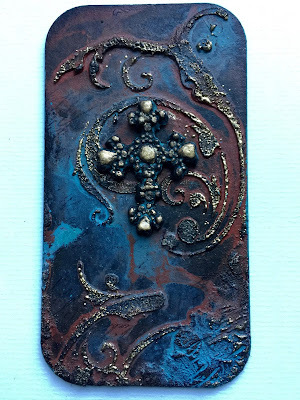 I was not sure if we were asked to make a project with dry or heat embossing, so I just made one with both. As you can see the background is dry embossed with Sizzix embossing folder. Then I covered it with clear embossing ink and added Stampendous embossing powders and components to get this dark messed look. The Tando frame was heat embossed with another Stampendous embossing powder. 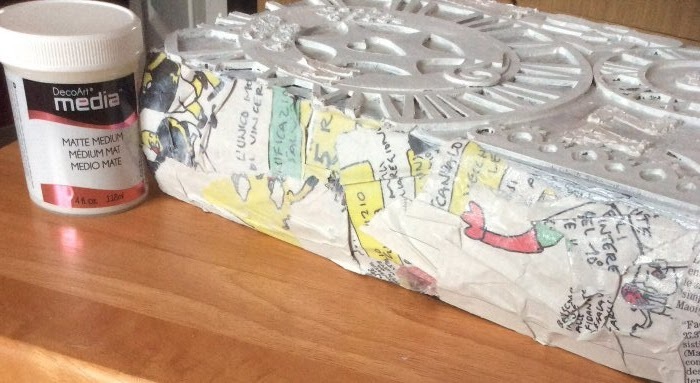 The both chipboard birds and the bird cage were also heat embossed with some old puffy embossing powder. The whole piece was done with recycled base: I used Tando packaging for the background and it's just a perfect piece for any background. Hi friends! 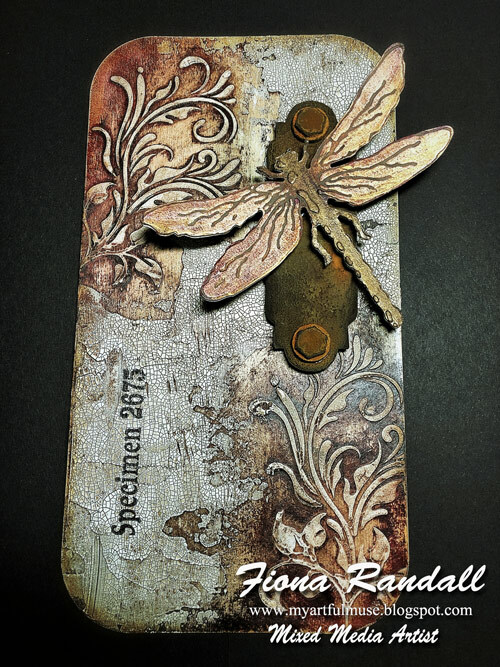 Dana here today sharing an Artist Trading Card I created for the Embossing theme this week. I pressed an ATC in a checkered embossing folder for a fun textured base and then primed the card with a coat of DecoArt White Gesso. 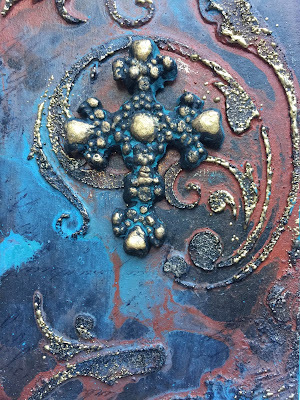 I then added color, with a distressed layer of DecoArt English Red Oxide Antiquing Cream and a layer of DecoArt Gold Interference for a subtle shimmer. I added a pop of bright green to the card by mixing Stampendous Hot Lime Fragments into DecoArt Matte Medium and spreading it on with a spatula. Before the medium dried I pressed in several gold sequins. To embellish the top of the card, I painted a Mini Book Plate with DecoArt Carbon Black Fluid Acrylic, then backed the book plate with a scrap of green stripe ticking, and added the number "25," from the Arthur Number Set, which I painted with DecoArt Cadmium Red Fluid Acrylic and a top coat of DecoArt Liquid Glass. I added leaves, a flower, a pair of decorative brads, and a sticker sentiment to fill in the design. I finished this card with a dry brushing of DecoArt Titanium White Fluid Acrylic. You can find the chipboard I used for this project, and a wonderful selection of DecoArt and Stampendous products, in the Tando Creative Retail Store. Happy Sunday! 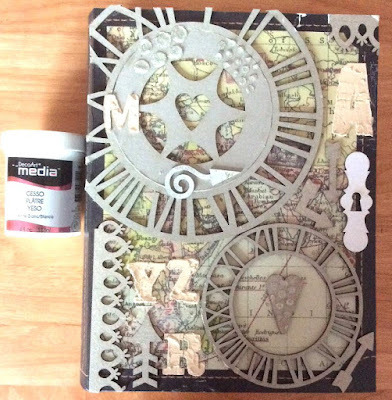 Hi Gez here sharing an altered book box with you today for the anything goes theme..
First thing to do was to design a layout of chipboard pieces, this was so much fun! 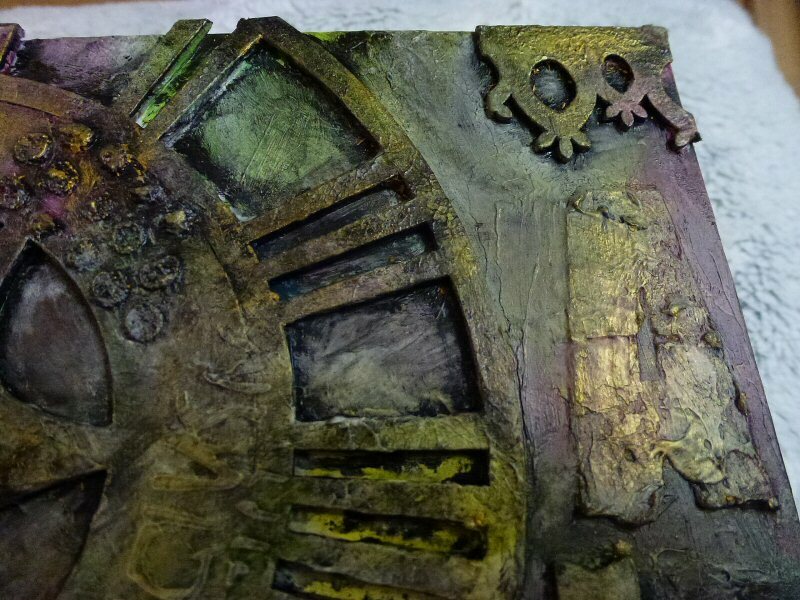 I've included pieces from the [3 clocks in 1] set, a lock from the [Locks and Latches] set, a heart from a [Grab Bag of Hearts], four of the gorgeous arrows from the [Arrows Grab Bag] and pieces of one of the fabulous [Lace effect borders]. I then added some textured stencilling through the [Letters] mask and also the [Sequin Waste Mask] so much fun! I added as much texture as possible! Then...................... getting LOST in the PROCESS !! My photographing ceased !!!!!! And for a while everything turned pretty ugly !!!!! After too-ing and fro-ing with [Titanium White], [Carbon Black] and even a little [Gold Metallic] paint.. I was happy ! A couple of butterflies were added to the finished dry book box for decoration and embellishment from the [Butterfly Grab Bag] they were treated to a delicious coating of Stampendous [Spoonful of GOLD DUST] and [Aged Rose Embossing Enamels] oh my goodness they are so yummy! Oh !!!! Those textures shine through !! Love the brush strokes on the spine! Hello my dear crafty friends and welcome to my new Anything goes post for Tando. This is my most favorite Tando product here- Printers tray and I made it as a Christmas project with a full tutorial for you. 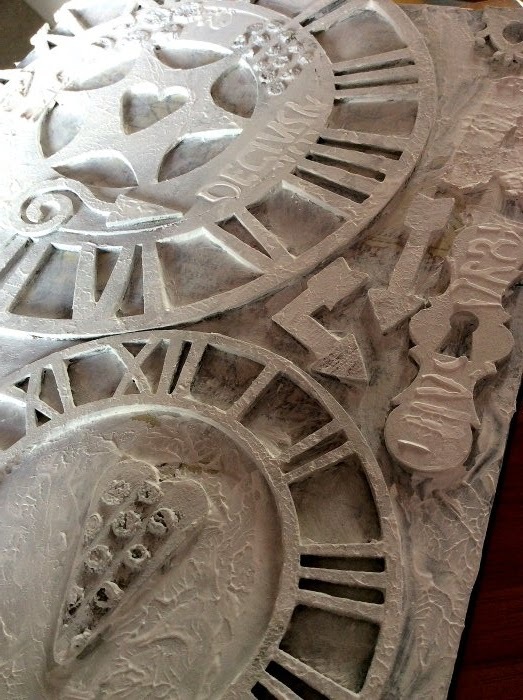 This is very easy to make project and it looks gorgeous with this tray and Happy New Year Tando chipboard on it. So here is my tutorial for you! Step by step: 1. 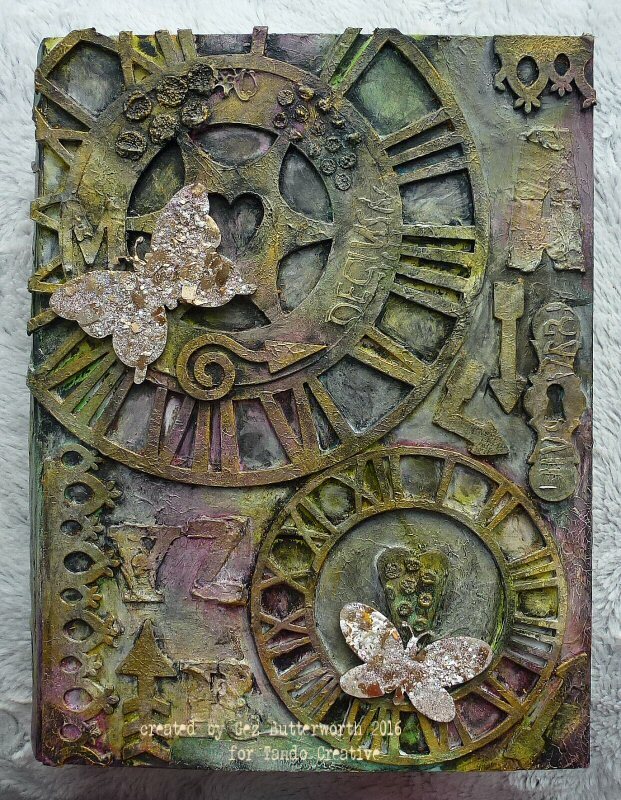 Paint the chipboard frame with green paint (Tattered Angels). 2.Glue patterned paper (7 Gypsies) over chipboard back. 3. Glue the back to the painted frame. 5. Hand cut the labels from Canvas Corp cardstock and add them over the frame. 6. Add bling and stickers.7. Heat emboss the chipboard words with black embossing powder and glue into the frame. 8. Add two small cloth pins (Canvas Corp). media boards and Tando's Long Flourish stencil. dry followed by liquid leaf gold. Deco art products used were the following :- Black Gesso, American Decor treasure & cameo & Patina antiquing cream. Stampendous products used were the following:- Chunky Gold Embossing Enamel & script stamp. From my stash:- Versamark ink pad. Hi friends! 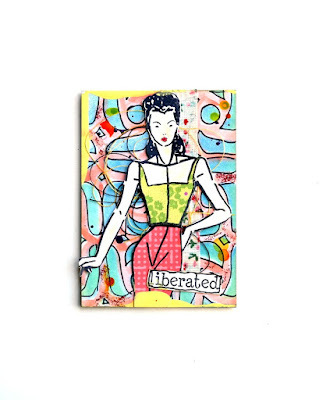 Dana here today sharing an artist trading card that I created for the Anything Goes theme this week. I started this project with a White-Lined ATC. 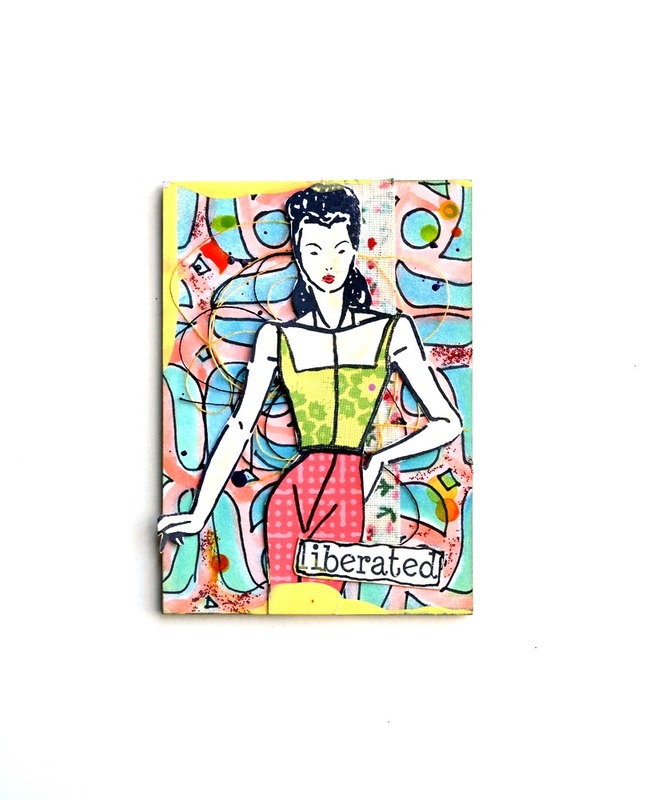 I then used the Nathalie Kalbach Fashion Dame Rubber Stamps and Stencil Set to create the background and the woman. I had a lot of fun with color, texture, and pattern on this small card. You can find the chipboard I used for this project, and a wonderful selection of Nathalie Kalbach products, in the Tando Creative Retail Store. Hi folks, welcome to this weeks creation for Tando. The theme is 'Make a Card'. As we are all very aware, Christmas is just around the corner and yes, I've failed miserably at sticking to one of my New Years Resolutions which was to start making Christmas cards early in the year. OOOppppppssss... I'm ashamed to say this is my first official card for Christmas. But anyway, I'm glad to say I'm very happy with it. I started with a 6 x 6 inch white super smooth piece of card. I took the Tando Joined Snowflakes mask and laid it at an angle over the bottom of the card, then inked through it. I randomly stamped sections of one of the stamps from Andy Skinner's Industrial Stamps set from Stampendous. 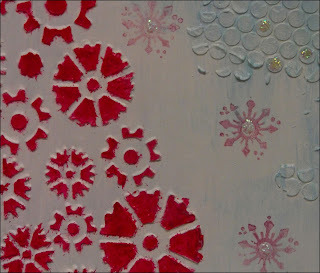 I then used the Bubbles mask from Andy Skinner and used DecoArt White Modeling Paste in random areas over the top of the Joined Snowflakes and Industrial stamping. I then used some wax to highlight the bubbles. I took the Tando Mini's Music and painted them with white gesso. When they were dry I gently rubbed over some wax to give it a shimmer. I then used the Tando Mini's Reindeers and painted them with DecoArt English Red Oxide. I finished them with a touch gold wax. To finish the card, I stamped a sentiment from on to a separate piece of card. Then cut it out and roughed up the edges with a pair of scissors. I lightly inked the sentiment with and inked the edges darker and adhered with a foam pad. all which are available on the Tando Website. Hello my dear crafty friends and welcome to my new card post and this time it was made with Tando gorgeous product for their Card week. 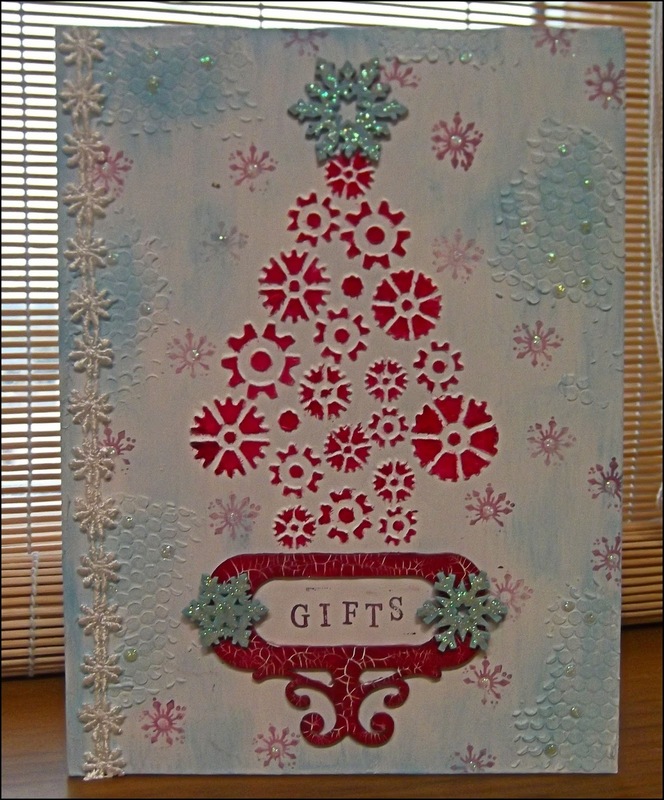 Mixed media card are very trendy right now, but this is a pretty traditional Christmas card with non traditional products such as Tando mask and a painted chipboard. I used a very traditional green and red BoBunny Christmas collection and added the ornaments with glitter paste using Tando Hanging Baubles mask . 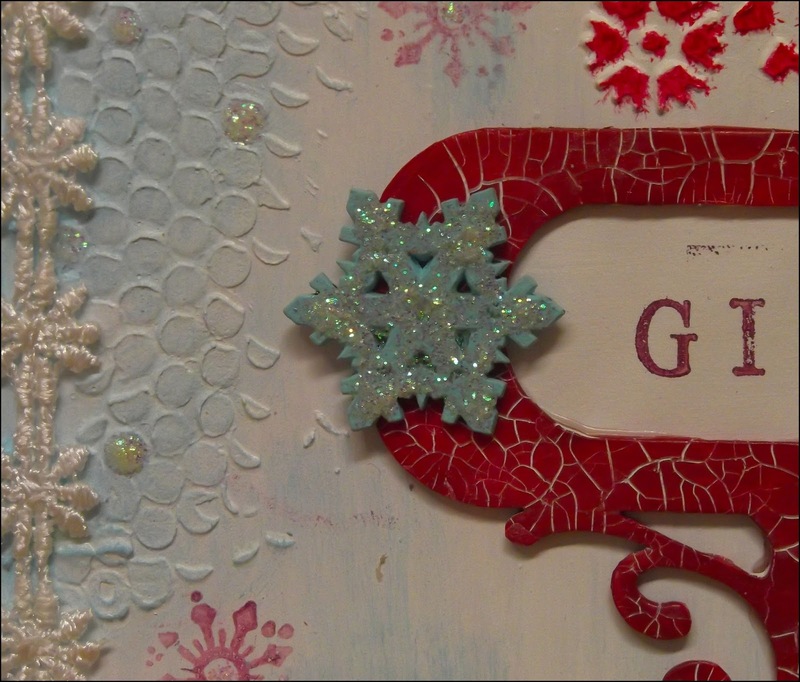 In between I painted Tando gorgeous Bauble ornament chipboard and added it over the card. 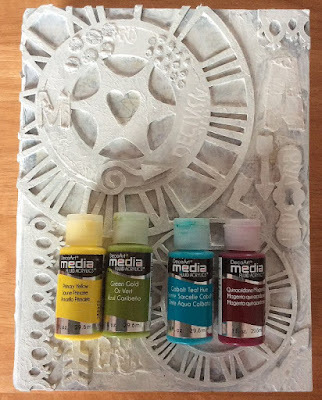 As you can see, even if you are not connected to Mixed Media cards or Mixed Media in any way, you still can make very regular Holidays cards with Tando products.